This poor dwarf Alberta has a nasty case of bagworms. Inertia is a property whereby objects in motion tend to stay in motion and objects at rest tend to stay at rest. One of the finest examples of inertia is the inexorable annual disappearance of evergreens down the gullets of bagworms, objects in motion, while homeowners, objects at rest, watch their evergreens slowly disappear. Populations of the bagworm have been on the rise recently in the Washington-Metropolitan region. Whether it's weather, a dearth of natural enemies, global warming, or just bad luck, we don't really know why we've seen more of this pest but we have. If you have bagworms, your plants, especially evergreens, may be in deep trouble by now. But if your conifers are not yet knocking on heaven's door, this is a good time to save them for years to come. Late in the spring tiny bagworms began to feed. The bagworm has been reported to eat more than 100 species of plants in our area. 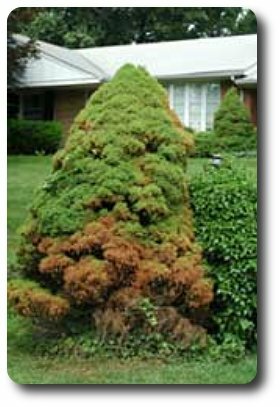 Bagworms are most damaging to evergreen hosts such as juniper, spruce, arborvitae, pine, and Leyland cypress; however, they will consume a wide variety of deciduous trees and shrubs with equal gusto. 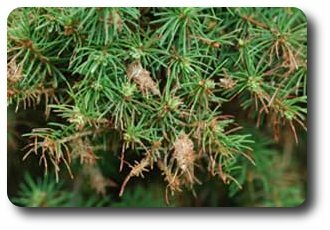 A complete defoliation of a pine or spruce will kill it in a single season. Deciduous trees such as sycamores or maple will be much more tolerant. The caterpillar pokes its head and legs out to move and eat. The bagworm is so named for its curious habit of carrying about its refuge, a bag woven of silk and plant parts. Back in May, inside the bag, eggs were completing their development. In May and early June tiny caterpillars hatched and emerged from the bottom of the bag. Some stayed put on their natal plant while others ballooned on silken threads to other plants nearby. The caterpillars constructed bags and enlarged their bags as they grew. Some mistake the bagworm for a pinecone. 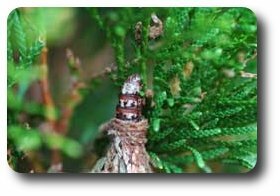 People confuse bagworm bags with a plant part such as a pinecone. However, a closer look may reveal the head and legs of the caterpillar as it moves about eating leaves or needles. By late summer, larvae complete their development and pupate within the bags. After a few weeks, the male bagworm, a black moth with clear wings, emerges from the bag and flies to find his mate. The female, a repulsive, wingless sack of eggs, remains in the bag during the visit by her suitor. After mating she lays several hundred to more than 1000 eggs in the bag. Like a tragic Greek heroine, she emerges from the bag, falls to the earth, and dies leaving eggs behind to hatch next spring. If inertia prevented you from acting earlier on your bagworm issue, by now the damage may be done. However, it is not too late to nip next year's incipient bagworm explosion in the bud. Hand removal of bags can be very effective in halting an outbreak, so put on a pair of gloves, grab a garbage bag, and start pickin'. As you remove the bagworms be sure to collect them in a container or bag, seal it tightly, and dispose of them. Do not simply toss the bagworms on the ground or in the driveway. The relentless bagworms will return, crawl up your tree, and resume their banquet. Now is not the best time for pesticides. The caterpillars are large and difficult to kill. Moreover, some larvae have completed their development and are no longer feeding. Insecticides applied to foliage now will not kill pupae, adults, or eggs. In addition many natural enemies of bagworms including birds, wasps, and voracious predatory bugs are killing bagworms as you read. Insecticide sprays may harm these good guys.